Sackets Harbor, NY - The four, sparkling, big waters of the St. Lawrence River, Lake Ontario, Niagara River and Lake Erie are companions to one of America&apos;s Byways and a National Recreation Trail. The Great Lakes Seaway Trail parallels 518 miles of freshwater shoreline in New York and Pennsylvania. Now available free - in print and online - is The Great Lakes Seaway Trail: Experience the Journey Travel Magazine. 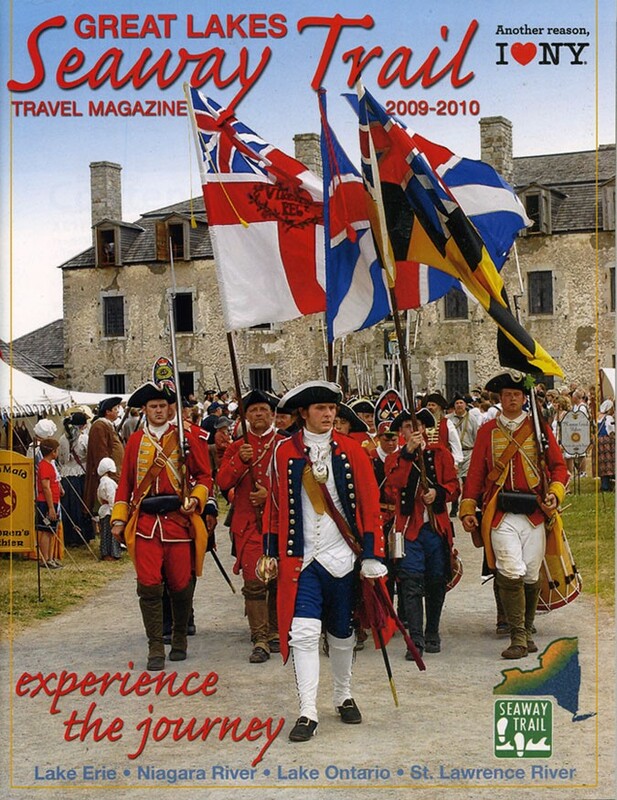 Military history and maritime heritage are popular travel themes for the byway as the colorful front cover of the 80-page, glossy color magazine suggests. A photo by Wayne Peters of Ransomville, NY, features a living history reenactment at Old Fort Niagara, site of the July 3-5 New York State Signature Event for the 250th French & Indian War Commemoration. More than 2,300 reenactors are expected for the event at the historic site that includes the oldest building on the Great Lakes. In a feature article, historian and reenactor George A. Bray III shares his knowledge of the three distinct cultures that fought the French and Indian War and invites you experience the battles for yourself at Old Fort Niagara, which hosts special events year-round. The byway region has recently been hailed as a great birding destination. The magazine&apos;s back cover features a collage of nine Great Lakes Seaway Trail bird paintings by wildlife artist Robert McNamara. McNamara is also the designer of the soon-to-be-published Great Lakes Seaway Trail Birding Guidebook. Inside travel guide, Western New York: An explorer&apos;s guide author Christine A. Smycznski shares her favorite places along the byway from the Erie, PA, and Chautauqua Count, NY, grape growing regions and a Niagara Falls tour aboard the Maid of the Mist to Rochester&apos;s Strong National Museum of Play and historic castles in the 1000 Islands region of the Trail. Angling expert Bill Hilts, Jr. provides insights into the "big waters, big fish" of the St. Lawrence River, Lake Ontario, Niagara River and Lake Erie. The travel magazine also includes a map, a list of the 28 historic Great Lakes Seaway Trail lighthouses (you can stay overnight in three! ), itineraries, events and festivals listings, a mini-guide to the Great Lakes Seaway Trail outdoor storyteller panels at significant sites, and a directory of attractions, accommodations and services. Find a printed copy of the Great Lakes Seaway Trail: Experience the Journey Travel Magazine at information centers and sites Trailwide and online at www.seawaytrail.com, or call 315-646-1000 for more information.